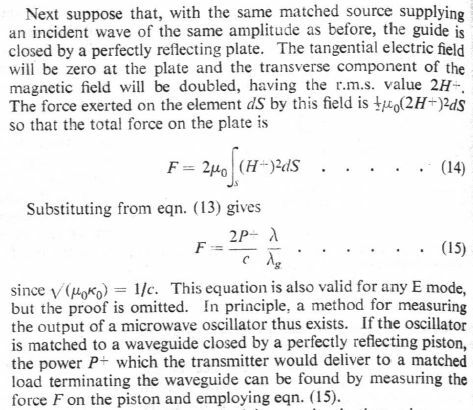 Could the thrust be generated by microwave transmission? What are the experimental results regarding the EM Drives? Does the EM Drive violate momentum- or energy-conservation? See Energy Conservation and Momentum Conservation. How does an EM Drive work? deltaMass has shown that Shawyer does not even understand that momentum is governed by the phase velocity, not the group velocity. Therefore any explanations for thrust (like Shawyer's) which are based on a difference between group velocities, are just plain wrong. Additionally Cullen has shown the reflection force generated on an endplate inside a waveguide is related to the guide wavelength or group velocity and not the phase velocity as claimed by deltaMass. The researchers at NWPU also agree with the Cullen 15 equation used by Shawyer and use it in their own calculations. So we have Cullen (backed by experimental data), Shawyer and NWPU all saying the level of the reflected Force on an endplate, in a waveguide, is related to guide wavelength / group velocity. Yet deltaMass says they are all wrong and it is related to phase velocity, which in a waveguide is above c and nothing travels above c.
Image of EmDrive thrust direction in posts attachment. 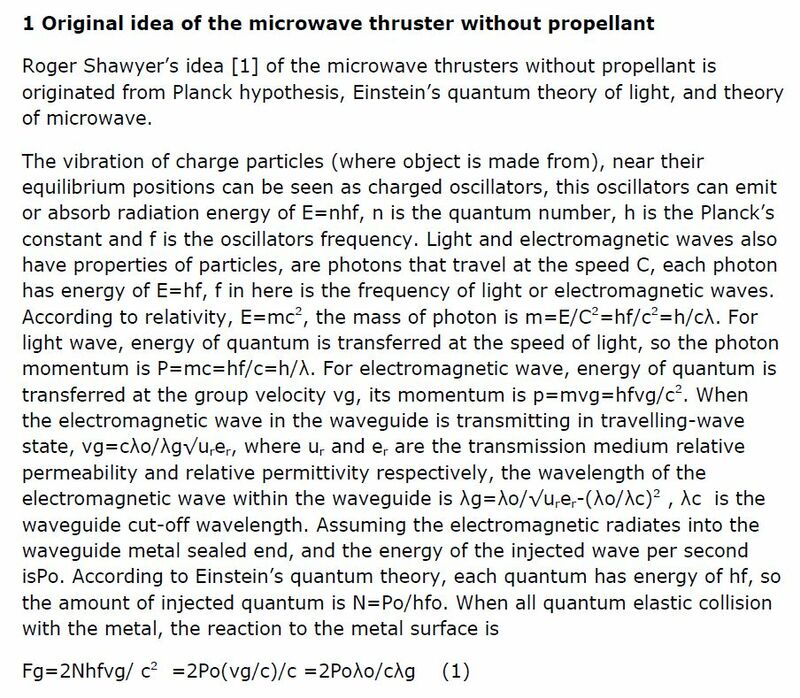 See the Theory page for a list of additional theories purporting to explain how the EmDrive works. Wikipedia has a lot of technical background. On Reddit, this subreddit has active discussion. This page was last edited on 7 September 2016, at 05:13.